“They are in their element,” is a phrase often used to describe a person who is doing superb work. Sir Ken Robinson describes how people often follow this path in his book The Element. You can discover more via the following link. When are you in your element? You may enjoy encouraging a person, cooking a meal, singing in a choir, caring for animals, nurturing a garden or whatever. 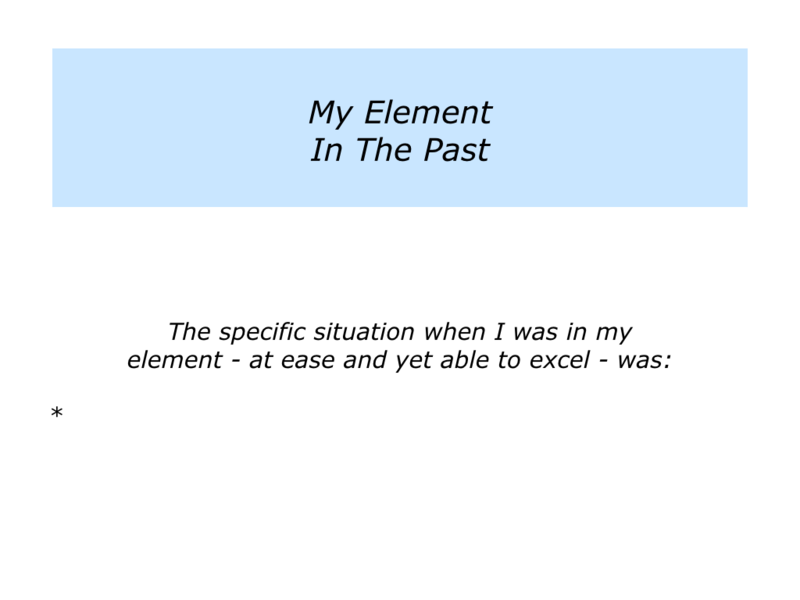 Describe a specific example in past when you were in your element – at ease and yet able to excel. Describe the specific things you did right then – the principles you followed – to do good work. Describe the specific benefits of doing this work – both for yourself and other people. “I simply feel at home. Things seem to come naturally. I see patterns clearly and know what must be done to achieve success. If you wish, try tackling the exercise on this theme. This invites you to describe the specific activities where you feel in your element. You may be writing, painting, solving certain kinds of problems, working with particular customers or whatever. You feel at home when doing these activities – at ease and yet able to excel. How can you spend more time being in your element? You may have a sixth sense in certain situations. So it makes sense to put yourself in the places where you have such talents. “I really enjoy solving seemingly impossible computer problems,” said one person. “Everybody else is going crazy – saying how much money the customer is losing – but I feel calm during the crisis. People often work best when they are following their passion and translating it into a clear purpose. They can then work to achieve peak performance. Ken Robinson explores this theme in the following video. Speaking at the RSA, he explains how we can begin to help people to flourish. Below is the full talk. If you wish, try tackling the exercise on this theme. This invites you to explore how you can pursue an activity where you are in your element. 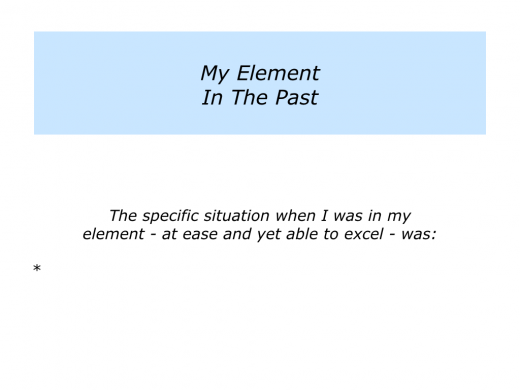 Describe a specific activity where you are in your element that you want to focus on more in the future. Describe the specific things you can do to focus on this activity. 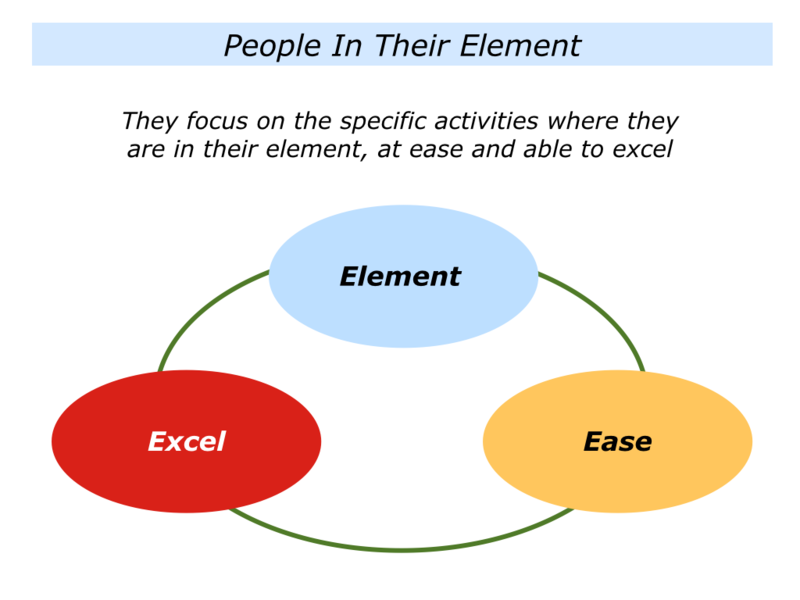 Describe the specific benefits of focusing on where you are in your element – both for you and for other people.